If you've been searching for a fantastic new vehicle, it's time to consider the Hyundai Santa Fe Sport. This car comes with an incredible number of benefits that you and your family will love. 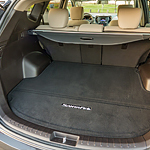 First off, the Hyundai Santa Fe Sport features plenty of room and spaciousness. If you've been looking for a way to ensure your comfort while you drive, this is the car for you. You'll also enjoy the Rear Occupant Alert system that lets you know if there are children or pets in the backseat of your vehicle, so you're always aware of what's going on around you. Ready to learn more? Come visit us at Spradley Hyundai to schedule a test drive today! You'll love all of the choices you have available.